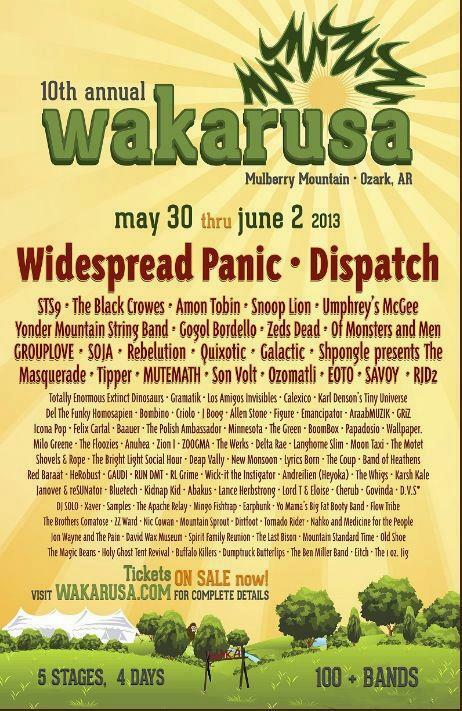 Wakarusa is extremely excited to share it's full 2013 line up. Wakarusa will celebrate their 10 year anniversary this summer with an epic lineup that includes: Widespread Panic, Dispatch, Snoop Lion, Gogol Bordello, The Black Crowes, STS9, and breakout electronic artist Amon Tobin along with over 150 musical acts from around the world. Wakarusa has developed a reputation for booking some of the nation�s best musical acts. Throughout the years, Wakarusa has presented some of music�s very biggest stars such as The Black Keys, Skrillex, Mumford & Sons, Bassnectar and last years sensations The Lumineers. Wakarusa is one of the longest running festivals of its type, catering to over 20,000 music fans each summer. Wakarusa brings musicians and fans together at one of the country�s premiere festival sites, Mulberry Mountain, in Arkansas. Fans make the sojourn to see some of the world�s best musicians in an �intimate� festival atmosphere. Wakarusa features 6 stages playing a variety of genres of music. Electronic (EDM), improvisational jam, rock, alt country, singer songwriter, alternative, funk, soul, hip hop are all represented during the 5 day, 175 set marathon event. Yet it�s not just the music that keeps the fans coming back year after year, the festival also offers a plethora of daytime activities such as waterfall hikes, artist led workshops, and disc golfing. Over the years, Wakarusa has proved to be one of the best places to catch a band before they break into the mainstream. Wakarusa specializes in presenting your next favorite band. This year will be no different, be on the look-out for a mind-blowing visual production with Amon Tobin, Tipper and the Kansas City based performance ensemble, Quixotic to name just a few of 2013�s likely highlights. On behalf of the entire Wakarusa staff, crew, musicians, and most importantly, our fellow music fans, we look forward to seeing you on the mountain this summer!